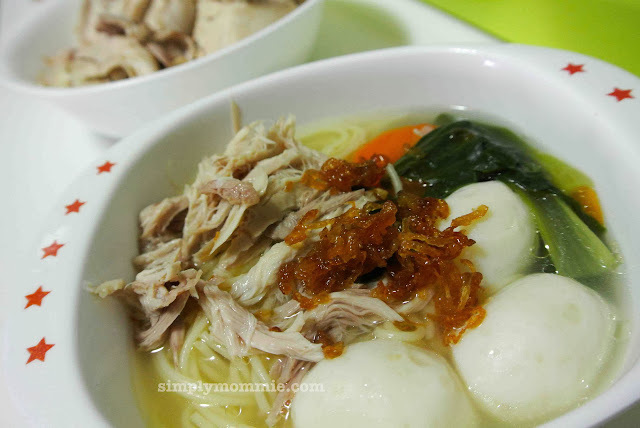 Some time back I posted a basic soup base recipe which you can use for enhancing the taste of dishes such as when stewing vegetables, for cooking porridge or 1-dish meals like soupy noodles or the gravy for crispy noodles (sheng mian). That recipe however uses chicken carcasses and pork ribs. This easy chicken stock recipe yields not only a very tasty soup but also enables you to have extremely tender chicken meat for you to include in your 1-dish meal. To get a piping hot 1-dish meal as shown below, simply follow the steps in the printable recipe! 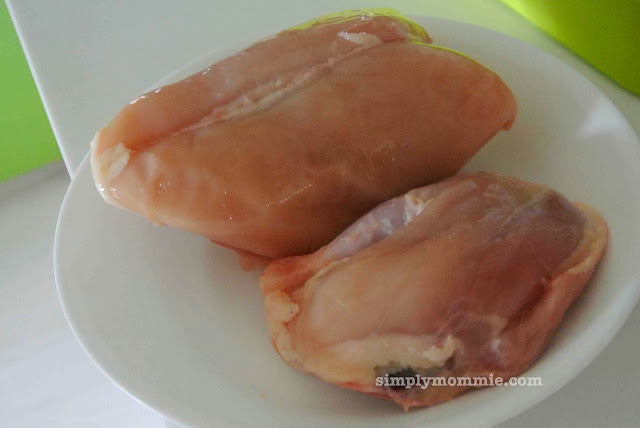 Place chicken breast and chicken thigh in a pot of water with enough water to cover the chicken. Bring the water to a boil then turn off the heat and remove the chicken. In a soup pot, place the chicken, dried scallops, garlic and 3-4L water and bring it to a boil. Turn down the heat and simmer the soup for at least 2 hours. Remove the chicken and shred the meat for use for 1-dish meals such as chicken noodle soup (as featured in this post) or if you have more than enough chicken for one meal, you can use it for chicken congee (upcoming recipe) for another meal! Remove the garlic cloves and cook the rest of the ingredients for the chicken noodle soup accordingly. Top with shallot oil, fried shallots, and chilli padi (for adults). 1. To get shallot oil and fried shallots, slice shallots thinly, place them in some oil - enough to cover about half of the amount of shallots, cover with microwave-safe wrap and microwave for 2-3min. 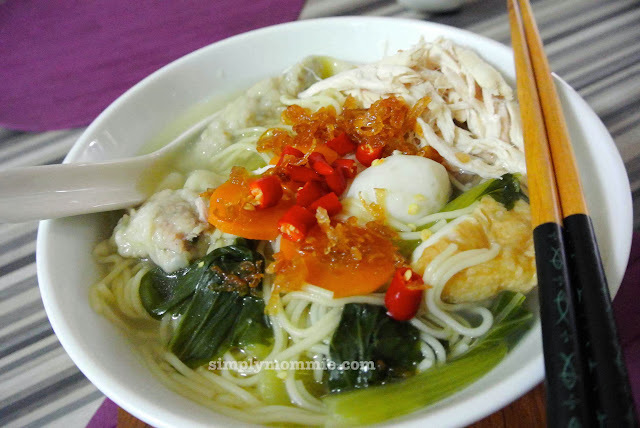 This entry was posted in 1-dish meals, Chicken, Chinese Food, Recipes, Recipes for the family, Soups. Bookmark the permalink.